0 Comments Published by KL Ocs Kid on Monday, August 24, 2009 at 10:28 AM. Steven Gerrard may face further disruption to his season after the man he punched in a nightclub said he was considering launching a civil action against the player and six of his friends. Gerrard was cleared of affray last month following the fracas with the businessman Marcus McGee, but six of the Liverpool midfielder's friends received suspended jail terms and community service. McGee, 34, who lost a front tooth and suffered facial cuts in the fight last December, said he has told lawyers to begin civil action for compensation for the injuries he received. The father of two said: "I've got dental bills and legal fees arising from what happened. But, more importantly, I don't think justice was properly served. "I still can't believe that they all walked free – that they effectively got away with beating me up." 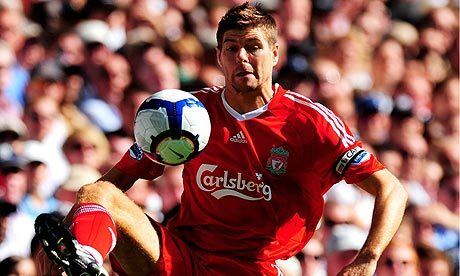 A jury at Liverpool Crown Court acquitted Gerrard of unjustly attacking McGee in the Lounge Inn in Southport, Merseyside, on 29 December, hours after Liverpool had beaten Newcastle United 5-1. Gerrard, of Formby, Merseyside, admitted hitting McGee but denied affray, saying it was in self-defence. Five of Gerrard's friends admitted affray and another pleaded guilty to threatening behaviour in a fight. They were handed sentences of 18 weeks' imprisonment, suspended for 12 months, and were also ordered to perform 150 hours of unpaid work. Meanwhile, James Milner has urged his Aston Villa team-mates to "get out and show some determination" against Liverpool tomorrow night and kick-start a season that has already brought rumblings of discontent among supporters. Two defeats in the first week of the season, as well as a lack of transfer activity, has left Villa fans frustrated, but Milner maintains there is the ability within Martin O'Neill's squad to pick up their first points of the campaign at Anfield and lift the gloom. "There's a lot of talent here," the England international said. "We've got a good mix. We could just do with a few more faces before the window closes. But it's all there for us. We showed last year what a good team we are. It's just about learning from the end of last year, when we struggled, and hopefully getting out of the blocks against Liverpool and kick-starting our season. "Hopefully we can go to Liverpool and perform like we know we can, and with that effort get a result. You've got to be able to go to these sorts of places. We proved it last year, when we had a great away record." Milner acknowledged that the 5-0 drubbing Villa suffered at the hands of Liverpool in March, when their season was beginning to unravel, should serve as further incentive. He described the defeat as "unacceptable" at the time and it has not been erased from his memory. "That should be an extra spur," he said. "It's always going to be a tough game there, but there's never an excuse to lose by that scoreline, especially with the quality that's in our squad. If Liverpool are to win the title, the common perception is that everything depends on Fernando Torres and Gerrard. However, Rafael Benítez believes that in José Reina he has the goalkeeper to win championships, just as Peter Schmeichel once did for Manchester United. "For me, he is the No1 goalkeeper in the Premier League," the Liverpool manager said. "Over the course of a season, he is the kind of goalkeeper who can win you titles. When you are at the top of the Premier League and attacking all the time, one save from your keeper can make all the difference, because defeat in one or two games can lose us the title. "He was good when he first started for us [in 2005] but now he is more experienced in terms of how the Premier League is played and is more mature and relaxed than when he first joined Liverpool – he talks to the defenders all the time." With Manchester United's Edwin van der Sar likely to be out of action with a broken hand until October and Petr Cech not quite the keeper he once was at Chelsea, Benítez's claim that Liverpool can field a better keeper than any other Premier League club holds water. The Greece centre-half Sotirios Kyrgiakos, Liverpool's new signing from AEK Athens, is unlikely to feature against Villa. Martin Skrtel, who fractured his jaw in the defeat to Tottenham Hotspur at White Hart Lane, should line up alongside Jamie Carragher.